The eCopy ShareScan line of document imagingsolutions sets competitive benchmarks in security, application connectivity, and user-friendly design. This easy-to-use software solution enables office workers to use Canon imageRUNNER MFDs to turn paper documents easily and securely into digital information that is integrated into their communication, collaboration, workflow, and business applications. The eCopy ShareScan family of products includes ShareScan Essentials and ShareScan Suite. 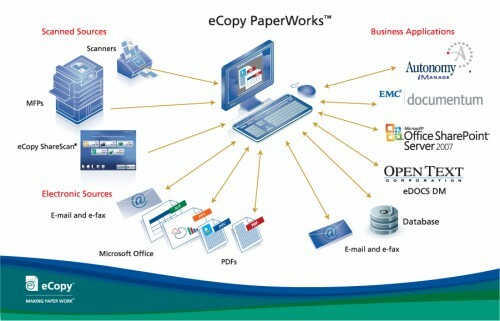 eCopy ShareScan® Essentials™offers scanning to e-mail, fax, network folders, and eCopy Desktop™. Users can quickly and securely scan paper documents and distribute electronic copies as PDF files, increasing workgroup productivity due to improved access to information. eCopy ShareScan® Suite™ includes the benefits of ShareScan Essentials as well as a bundle of connectors to provide native integration to leading document management, e-mail, fax, database, collaboration, and cost-recovery software applications. Canon offers eCopy ShareScan to businesses that can benefit from document imaging connectivity to multiple business software applications. The integrated system works with Canon imageRUNNERs, allowing the devices to connect to networked applications.